Like everyone else I’m pinning my brains out on Pinterest (Julieptc — in case you want to follow.) I repinned this chicken recipe from a pin that originated from a post and then I’m going to repin the pin tonight from my post!!! Confusing but fun, nonetheless. 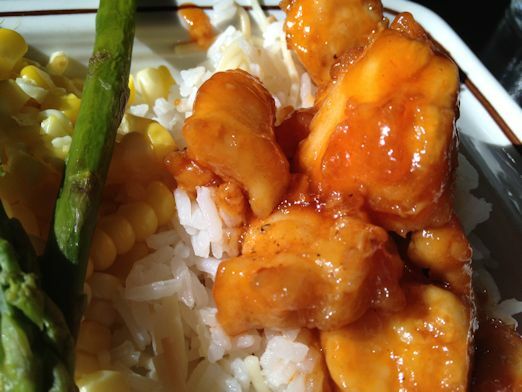 I made this Sweet and Sour Chicken recipe for dinner tonight. It originated from Made it Ate It Loved it. I We all loved it, too, and I will definitely make it again. Here’s the original photo. Looks yummy. Here’s my photo. I think I didn’t brown mine enough for that Kodak moment but it tasted good with or without the Malibu Barbie tan on the chicken. Besides, this was the first time I tried it and I will know to adjust my cooking next time. Rinse chicken, trim off fat and then cut into 1 inch cubes. Season with salt and pepper. Dip chicken into cornstarch and then into eggs. Heat oil in large skillet. Cook chicken until browned. 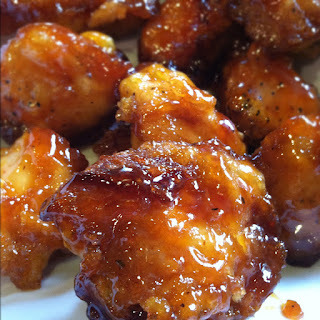 Place in baking dish and pour sauce over chicken. Whisk all ingredients together until smooth and then pour evenly over chicken. Turn chicken so the sauce gets on both sides. Bake at 350 degrees for 15 minutes. Turn chicken over and cook for 15 minutes more. The original post says this recipe is adapted from Mel’s Kitchen Cafe. Now, back to my boards! I have a Basil Chicken with Cream Sauce planned for tomorrow from Pinterest. Can’t wait to try it! This looks so good! I am going to have to try it! Can’t wait to see how your Basil Chiken with Cream Sauce turns out. Mmmm, I’d say you nailed it. Looks good.